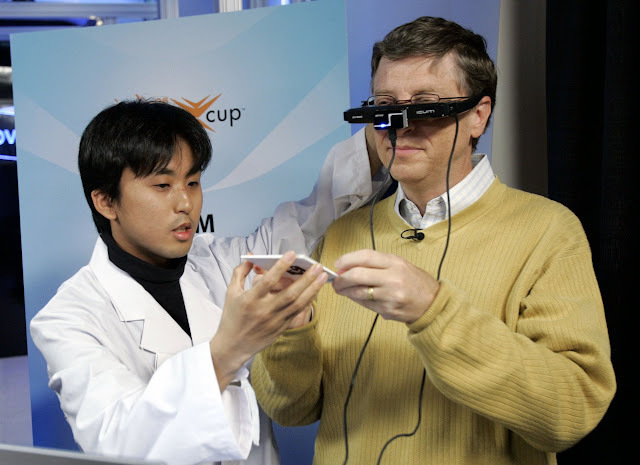 Bill Gates has long ago stepped into, or at least “been dating”, the Educational "Serious Game" Market. Imagine Cup is the world's premier student technology competition that challenges students to build life-changing projects that can ultimately transform the world. Microsoft created the competition nine years ago as a way to highlight and recognize student innovation around the globe, as well as inspire more young minds to study technology. Each year, the projects have become more inspirational and impactful. Students who participate gain real-world skills that help them in school, in their careers or even as they commercialize their projects, all while tackling global problems. Over the years, project teams have had the chance to share their world-changing Serious Games, where players take on the role of city planners, help find alternative energy solutions, end poverty through the use of advanced technologies, save the world from a worldwide epidemic, clean up contaminated rivers or end deforestation. According to Microsoft Vice President of Developer and Platform Evangelism Mark Hindsbo, projections show there will be about 1.2 million computer specialist jobs in the United States in 2018. Yet current trends show that the United States has only half the number of college graduates needed to fill those positions. Also, only about 15 percent of U.S. undergraduates are studying science, technology, engineering and math (STEM) compared to two or three times as many in countries such as India and China. Now, the Bill & Melinda Gates Foundation announced a suite of investments, totaling more than $20 million, focused on identifying and expanding promising cutting-edge learning resources that support teachers and students and bring innovative new instructional approaches into America's classrooms. These investments support the development of of game-based learning applications (Serious Games); math, English language arts and science curricula built into digital formats; learning through social networking platforms; and embedded assessments through a real-time and engaging environment of experiences and journeys. SEATTLE, April 27, 2011 /PRNewswire-USNewswire/ -- The Bill & Melinda Gates Foundation announced a suite of investments, totaling more than $20 million, focused on identifying and expanding promising cutting-edge learning resources that support teachers and students and bring innovative new instructional approaches into America's classrooms. These investments support the development of game-based learning applications (Serious Games); math, English language arts and science curricula built into digital formats; learning through social networking platforms; and embedded assessments through a real-time and engaging environment of experiences and journeys. All these promising resources are aligned to the Common Core State Standards, which are college- and career-ready standards being implemented in more than 40 states. The Pearson Foundation, one of the major partners in this work, today is also announcing the development of its complete digital curriculum to support the standards. The foundation is pleased to work with Pearson Foundation by providing research and $3 million in funding to help make these tools widely available. In addition to the Pearson Foundation, the foundation is also partnering with Educurious Partners, Florida Virtual School, Institute of Play, Reasoning Mind, Quest Atlantis, Digital Youth Network and EDUCAUSE to develop and promote new applications for learning and assessments aligned to the Common Core State Standards. "Teachers are telling us what they want, and we are listening," said Vicki L. Phillips, Director of Education, College Ready, at the Bill & Melinda Gates Foundation. "We believe these exciting world-class tools have the potential to fundamentally change the way students and teachers interact in the classroom, and ultimately, how education works in America." A significant part of these investments announced today include supporting work to build a complete system of digital courses aligned to the Common Core State Standards. The Pearson Foundation, the philanthropic arm of Pearson, the leading learning company, is developing 24 online math and English language arts courses to help teachers and principals implement the standards. These courses will be delivered through a combination of technologies, including video, interactive software, games, social media, and print. Funding from the Bill & Melinda Gates Foundation will support the development of this robust system of courses, including four— two in math and two in English language arts—to be available at no cost on an open platform for schools. In addition, with a $2 million grant, Florida Virtual School, the nation's first statewide, Internet-based public school, will also develop four new digital courses aligned to the Common Core State Standards. These include two literacy-based and two math-based courses that are contextualized within disciplines, such as engineering or writing in the natural sciences. The foundation's $742,996 investment in Reasoning Mind offers teacher professional development and online elementary math curricula that build algebraic thinking, will pilot a program that makes a single effective math teacher available across multiple classrooms. If successful, one Reasoning Mind-trained teacher can affect the math scores and proficiency of 250 students using the program in different grades at several schools. A Reasoning Mind classroom is a hybrid of online and face-to-face instruction, where the teacher gives each child individual help and attention. "Technology has advanced how we do so many things today," added Phillips. "Yet, instead of transforming our schools, technology has generally been placed on top of antiquated models. These new cutting-edge applications have the potential to inspire students and engage them in the way they naturally learn, while giving teachers the flexibility to be creative in their craft and customize tools to their students' needs." · $2.6 million for iRemix, which is being developed by Digital Youth Network. It will be a set of 20 literacy-based trajectories that allow students to earn badges and move from novice to expert in areas like creative writing. · $2.5 million to Institute of Play will build a set of game-based pedagogical tools and game design curricula that can be used within both formal and informal learning contexts. · $2.6 million to Quest Atlantis is creating video games that build proficiency in math, literacy and science. All these applications will support the Common Core State Standards. In addition, a $2 million grant to Educurious Partners will help develop high school courses in biology, freshman literature, and Algebra I through a social network Internet application. The application will allow students and teachers to collaborate with a variety of experts who are working in professional fields that are relevant to what the students are learning in the courses. These courses will also support the Common Core State Standards. Finally, in June, Next Generation Learning Challenges will award up to $10 million in competitive grants to support promising technology-enabled programs built around embedded assessments that can help students master 7th, 8th, and 9th-grade content and competencies aligned with the Common Core State Standards. Embedded assessments are a way of testing a student's knowledge in real-time through programs such as online math courses that help students self-pace their learning, game-based learning environments, and literacy instruction delivered through mobile phones. While learning in a digital environment that uses embedded assessments, students demonstrate mastery of a subject in order to progress to the next level of a game, course, or application. Next Generation Learning Challenges is a grant competition and community aimed at identifying and expanding promising technologies that can help improve education across the K-12 and postsecondary spectrum. It is led by EDUCAUSE and community partners with support from the Bill & Melinda Gates Foundation and the William and Flora Hewlett Foundation. Guided by the belief that every life has equal value, the Bill & Melinda Gates Foundation works to help all people lead healthy, productive lives. In developing countries, it focuses on improving people's health and giving them the chance to lift themselves out of hunger and extreme poverty. In the United States, it seeks to ensure that all people—especially those with the fewest resources—have access to the opportunities they need to succeed in school and life. Based in Seattle, Washington, the foundation is led by CEO Jeff Raikes and Co-chair William H. Gates Sr., under the direction of Bill and Melinda Gates and Warren Buffett.